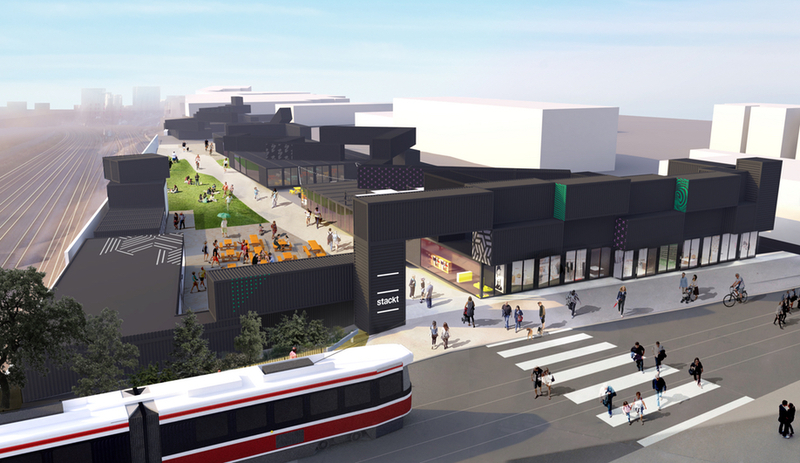 Spearheaded by area locals Matt Rubinoff and Tyler Keenan, Stackt Market will transform the lot of a former smelting plant that has stood vacant since 2014 into a multipurpose public space, with the majority of the expected 130 containers devoted to pop-up retail space. The rest of the stacked volumes will be open to cultural, arts and events programming. It’s a temporary endeavor – Rubinoff and Keenan have a two-and-a-half-year lease to use the 9,290-square-metre plot of land before future plans of turning it into a park get started – but one that promises to breathe new life into a neglected area of the city. They’re offering companies and organizations flexible lease lengths and adjustable spaces, such that “anchor tenants” who have agreed to stay for the whole two-and-a-half year period will exist alongside a constantly evolving ecosystem of pop-up shops, service providers, and brands. Market 707 at Dundas and Bathurst Sts. is already using shipping containers to house small businesses just south of Toronto Western Hospital. An article about a mobile market starting up in Massachusetts is attached. After reading it (well even before reading it) I must confess I was just not sure about mobile markets as the method for adding healthy food to a community. The purpose of the farmers market is to allow civic engagement to happen at such a regular interval that behavior change can also happen. Farmers can slowly build their business to meet their face to face customer needs, shoppers can watch others shop and compare notes and learn the seasonality of their region among other things and the neighbors get an amenity that encourages a more vibrant area. All of these things take time and sustained effort and even with the best of intentions may still fail but if it does all work, it can lead to a powerful change in a community. That is the promise of a farmers market, and it also allows everyone to be part of the decision making. And may I add, the use of the term “market” in its title also troubles me as I think it implies a system that resembles a farmers market and yet we share almost no characteristics with mobile food initiatives. And as someone who helps build and expand public markets, let me say this: I don’t believe that we have done enough with it yet. I think the type of market that we see in most cases is a “flagship” or “neighborhood niche” (some typology terms that are evolving in the market field) which may not fit the goals of some communities. I believe that there are many types of market types for communities that are organizing themselves. For example, there is a type of farmers market for food deserts (food security market type) that we have yet to fully understand or what the uses of those other types could be. What worries me about people jumping completely to to the next bandwagon is that I wonder if the mobile market is actually a barrier to communities ever getting a full-fledged farmers market. Adding to that, I think farmers markets are part of a spectrum that can ultimately get communities other food retail options, including at times, full-scaled grocery stores. Can mobile markets lead to that? I’m just not sure. However, I do see that mobile markets can offer some short termed food access answers and also gather some data about choices that a neighborhood wants. Also, that the mobile market can help some small farmers get prepared for farmers markets among other things. I also appreciate the nimbleness of the mobile option. I did some research for a potential mobile market while working at MarketUmbrella in New Orleans after Hurricane Katrina and still believe that there is a use for it in disaster-struck communities. And having talked with the good people of Toronto FoodShare and others who are thinking about the mobile market role, I suggest that it might be a useful bridge to offer healthy prepared foods that could arrive in a neighborhood throughout dinner time and by using local fruits and vegetables in their simple recipes (meals under 4.00 for families and less than 15-20 minutes prep time perhaps?) still support local growers. So I wonder if how communities deploy farmers markets and mobile markets separately and together could be analyzed using similar measurement (Oh I may find the time to do this myself soon!) and where there has been a successful model of a mobile market, that some in-depth research can be done of this option as an answer to food system needs. Changing behavior takes time and a regular commitment and even though the idea of a moving truck sounds good as a way to get to more people, it also takes the chance away of establishing a haven that can become the start of a neighborhood getting long term amenities. BUT I lay part of the blame on public market advocates: in order for food system organizers to know what farmers markets can do, we have to share data about what they do. And find ways to encourage a full spectrum of answers that should well include mobile food. 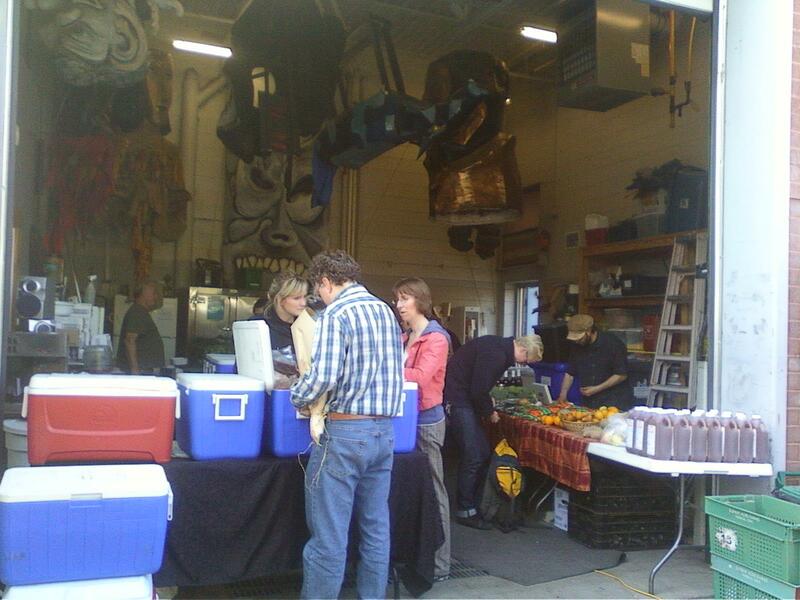 A mobile farmers’ market revs up – Food Features. 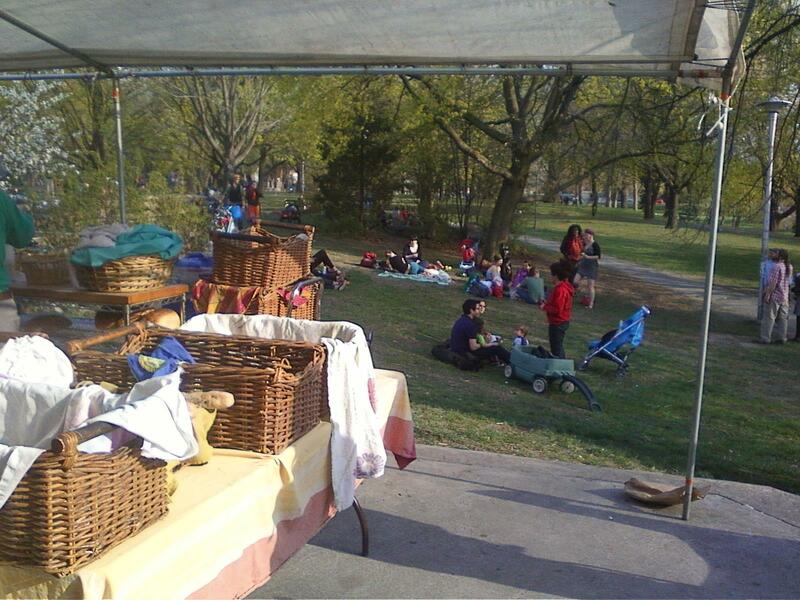 I had the pleasure of visiting our food community in Toronto in mid April, courtesy of the Greenbelt Farmers Market Network and its organizers, Anne Freeman and Sara Udow. 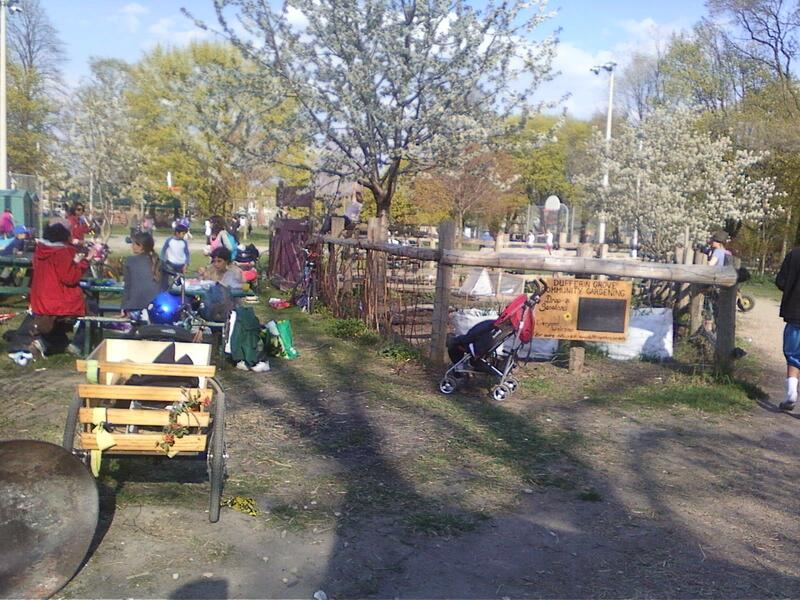 Before I left, I was able to visit Anne’s well established, highly respected market (many people I chatted with throughout the city mentioned this market to me when they found I work with public markets), the Dufferin Grove Farmers Market. 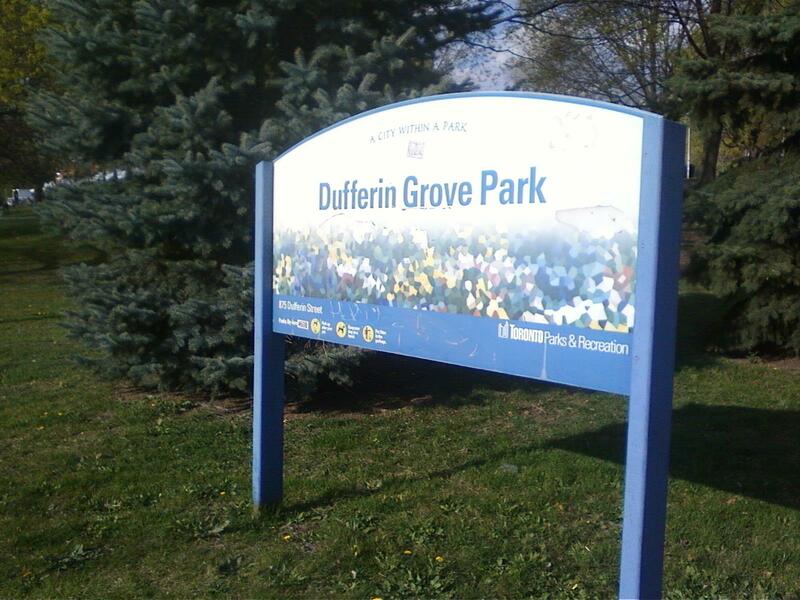 The Dufferin Grove Park is a study in itself, and deserves to be used as an example by other neighborhoods that want to be a bridge for their residents and to use their space to inspire and share. I had the great fortune (thanks to Anne Freeman) to sit down with Jutta Mason who has dedicated much of her time to the evolution of this park and its activities. I could say more nice things about Jutta, how market organizers should be so lucky to have a partner like her, but she’d just find this lionizing of her quite odd probably. 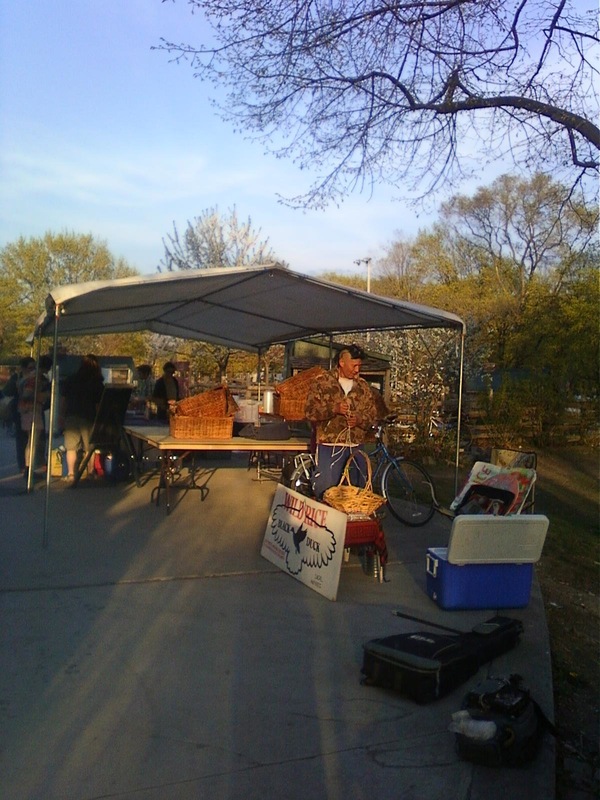 In any case, this is a fantastic Thursday evening farmers market that has been around for a decade already and will be there for future generations…. Folks sitting on the grass in Dufferin Grove Park next to the weekly farmers market. Anne Freeman, the manager of the Dufferin Grove Park Farmers Market is seen here (in pink shirt) talking with one of her vendors in the Zamboni storage area (it is Canada after all!) where the market camps out in the winter and then spills out into the walkway for the rest of the year. 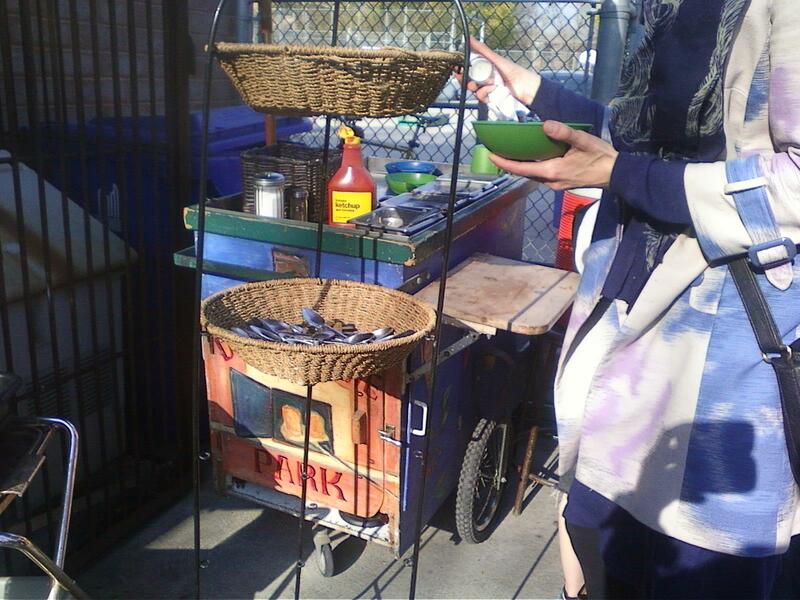 The market sets up this cleaning station for shoppers to add condiments and to clean their plates. A very attractive set up.. 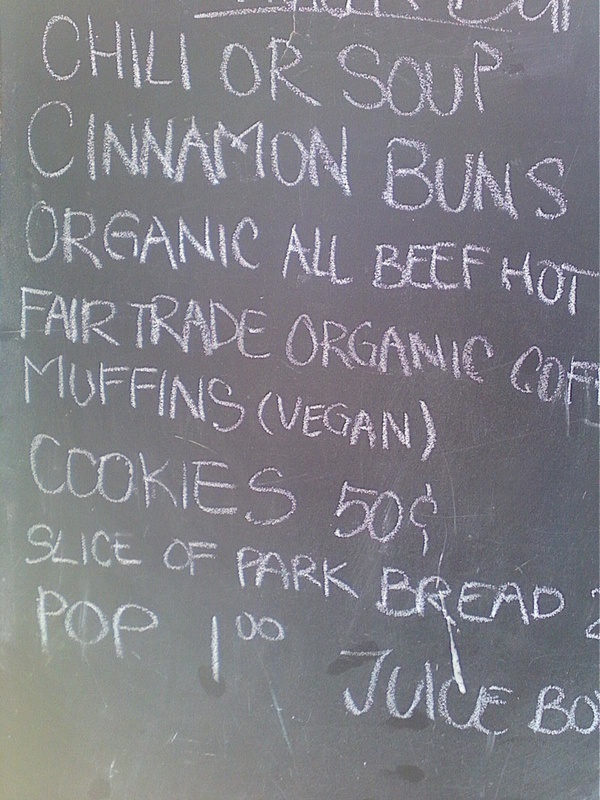 The market sale board for the park folks who make bread and food in their bake ovens and have a Friday night dinner as well. 2. Every food organizer I met on that trip understood that the farmer/producer needs to remain as the central partner in all projects. In other words, I didn’t come across lip service to the needs of the farmer. That lip service is usually found in code words or phrases such as “scaling up” or “elitist farmers markets” in food system conversations that I find myself in across North America and in other Western countries. Those code words tell you that the sayers are content to ignore the facts of the relative age and sophistication of our work and the intractable nature of the industrial food system so far. I instead heard complex, thoughtful responses to the needs of farmers while balancing health equity needs for shoppers. I wish I found that more often in my travels. 4. Internal evaluation is becoming known and necessary. I can’t wait to tell you more about the dynamic presentation (and later meeting of the mind) I experienced through Helene St. Jacques, a Food Share board member and marketing research professional showing results of the research done on behalf of the markets. . And, I look forward to doing some of that US/Canada evaluation sharing with Helene as well. Canada, case studies/research, environmental issues, evaluation, international farmers market news, market vendors, social cohesion, Where's Dar now?